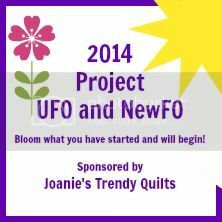 Thank you to those who have already submitted their 2014 lists for unfinished and planned new quilting, knitting and other needlework projects for 2014. Given to a request I will be extending the due to date to February 28th, the last day in February. That gives you a bit more time to plan. Anyone wanting to add or subtract may do so. If you have already sent your list resend your new one letting me know it is an updated version one. Anyone wanting to join in click on the image and it will link you to the details of the challenge. Check out dq's list. My list here. So you have created your lists - now what? There are several ways you can go about it. You can number each one in consecutive order or assign a month to the item on your list as to when you would like to finish it. Or if you prefer you can look at your list on a monthly basis and determine which will be your projects for the upcoming month. I have chosen the latter approach since it is less rigid and prevents me from having a sense of being overwhelmed. I have chosen my projects for February and since they happen to be unfinished ones I have placed pieces of them on my design board. If you want to work on a new project as listed maybe a picture taped on the wall or pinned to your design board. Now you have a fresh reminder every time you walk into your sewing/quilting or favorite area if it is knitting or other kind of needlework. Here are my projects I am committing to finish in February, both well over due but not my oldest unfinished ones. 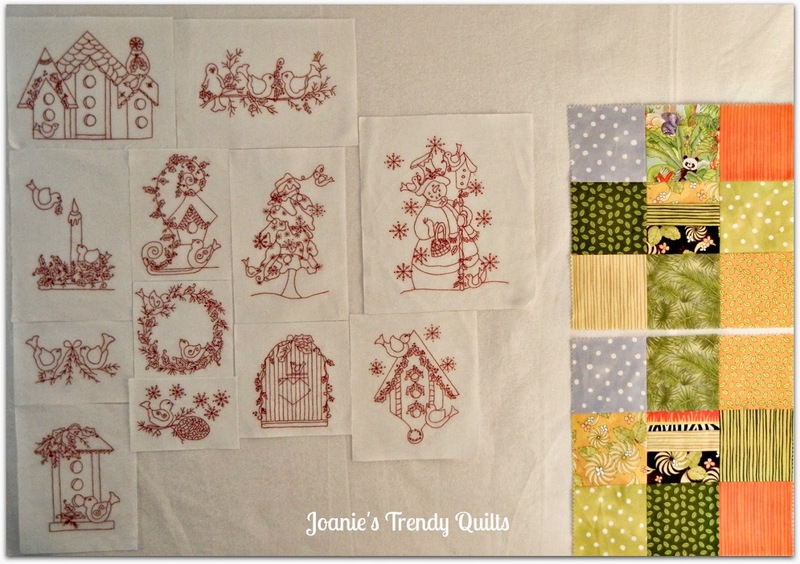 The red work will be made into a quilt and the 2 - large nine blocks will be a tote bag, a small project to have the gratification of a quick finish. Plan your supplies and fabric list. In order to complete the tote bag I will need fleece and for the red work quilt fabric for the top and back, and batting. Knowing exactly want I need I will be looking out for sales. The baseball t-shirt is also on my February list as well. Only one more section to free motion quilt. Last evening I hand sewed the back where the two sections come together. Being it was a cold day/evening the heavy quilt on my lap kept me nice and warm while I stitched away with heart content. The two sections came to together well. First I used a 24" rotary cutter ruler to push the edge close to the seam and drew a line for accurate cutting with scissors. Next the batting from the opposite seam line was cut close to the seam line and the backing seam cut one inch from the seam line leaving enough to fold the edge 1/2 inch. Instead of using pins to hold the seam in place I used glue and iron to the fold over seam and then hand stitched the seam closing. Bloom Project Participants rev up your sewing machines or needles. 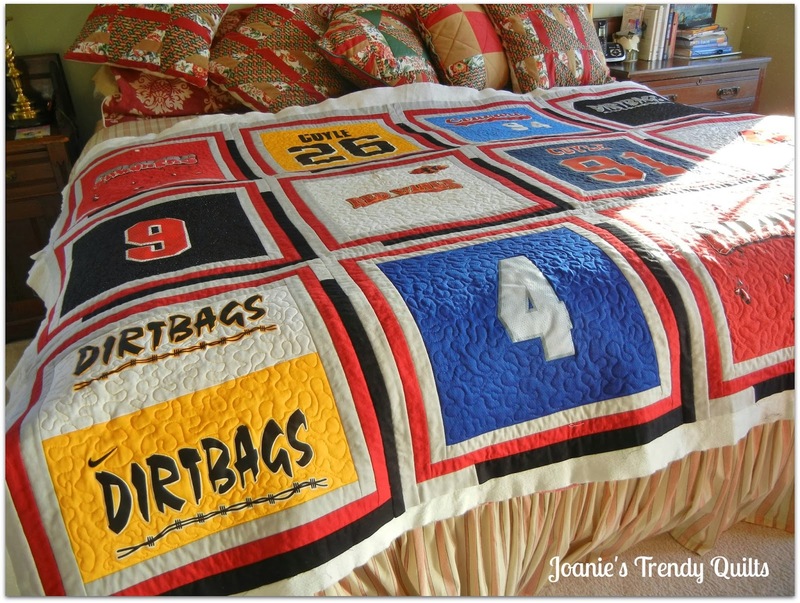 Anyone needing to contact me by email can at joaniestrendyquilts@aol.com. I'm sitting here squaring up another round on all of my log cabin blocks. These aren't going very fast, but I did promise to have a wall hanging for our county museum done by May. I should add to my list to buy flannel to make a design wall. I am going to knock two off my list in Feb. My Chevron quilt and my Square in square quilt(i think thats what i called it:) I just got them basted and ready to go! You go girl! That is awesome! 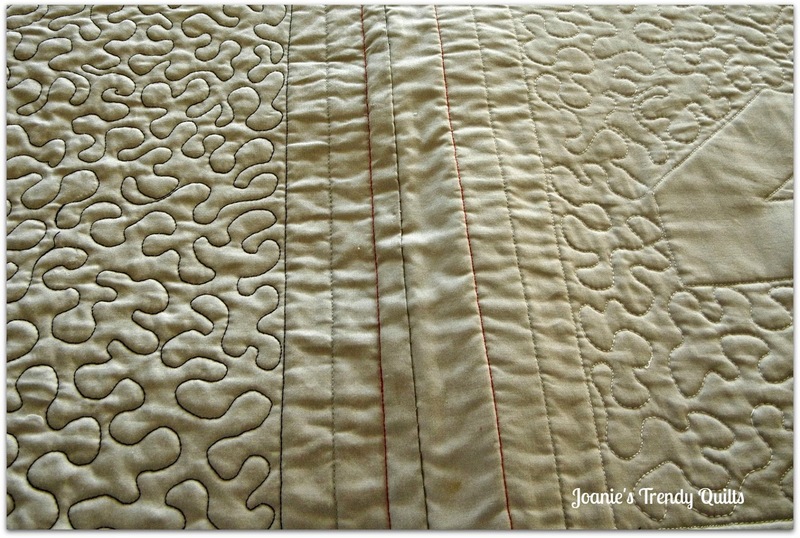 Great projects you are working on Joanie! Thanks for sharing.